The Economic Developers Council of Ontario is pleased to announce this new workshop series, presented in partnership with the Ontario Ministry of Agriculture, Food and Rural Affairs. Performance Measurement is the process of monitoring, measuring, assessing and reporting on the progress that a plan, such as an economic development plan is making towards the desired outcomes. · Use the resource that can help you improve the efficiency and effectiveness of your economic development investment. · The training will provide a seamless, step-by-step approach to understanding, designing, communicating and measuring the performance of economic development activities. 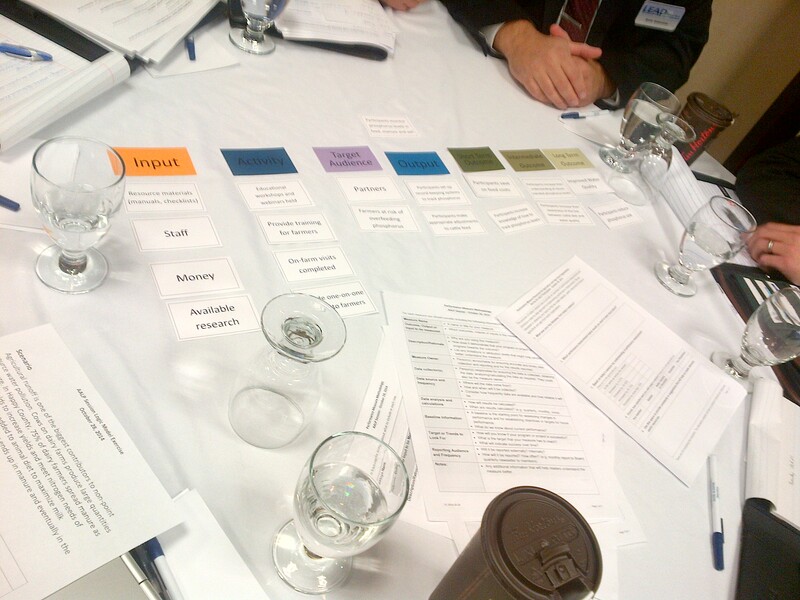 A logic model is a visual representation of the connections and relationships between inputs, outputs and outcomes. It can serve as a road map for planning initiatives. It illustrates what activities you will undertake and the intended results using graphics and text. Logic models are designed to be flexible; if factors come unexpectedly into play, the logic model can be adjusted. Logic models come in different formats but the basic information is the same. I recently had the opportunity to attend the PuMP Toronto Workshop. PuMP is a performance measurement process that was created by Stacy Barr and licenced to Adura Strategy in Canada. OMAFRA’s Rural Economic Development Branch provides performance measurement resources to our clients; I am a firm believer in the value that they bring to measuring an organization’s impact and am always eager to hear what new methods and techniques are available to do so. This intimate workshop brought together public and private sector organizations from across Canada, (participants represented organizations from Calgary, AB to Saint John, NL and all points in between) to learn about effective techniques, using the PuMP performance measurement blueprint. A new performance measurement guide has been developed for Agriculture and Agri-Food organizations. The guide takes the reader through a step-by-step process designed to to help organizations develop a performance measurement plan. As I stated in my last blog post “Effective Economic Development Requires Data”, data is critical to understanding the local and regional economy. Expanding on that point, there are three main areas where data supports economic development. Performance measurement is the collection and analysis of data and the reporting of the data results. Performance measurement helps organizations assess the progress their initiatives are making towards desired results. The results can include both outputs (what products or services an organization delivers) and outcomes (the resulting change that occurs as a result of a product or service being delivered).